The Weinstein Company has already started the hype machine for their documentary Salinger, about the reclusive and iconic author J.D. Salinger who famously wrote the classic novel The Catcher in the Rye. The documentary and accompanying book reveals tons of unknown secrets and facts about the author included an unprecedented amount of unseen footage, photographs, and biographical information on the author who went almost completely off the radar for years. 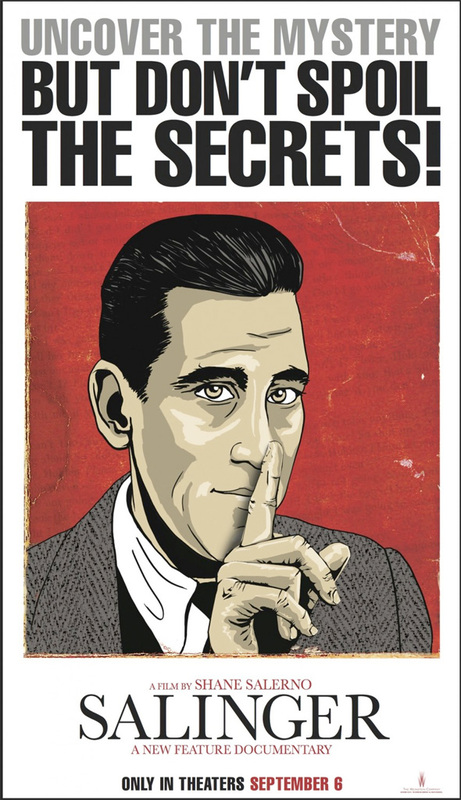 Now TWC has revealed a poster calling for some tight-lipped secrecy about some of the secrets within, but one of the revelations just couldn't stay contained. "Because of the revelatory and confidential nature of the documentary and book, Salerno, TWC and Simon & Schuster are encouraging audiences and industry insiders who see the film and read the book to remain tight-lipped on the secrets they unveils and give others a chance to experience them for themselves. The film has only been allowed to be screened by a hand selected group of press and insiders, and those seeing it before its official release date are being asked to sign nondisclosure agreements." The Weinsteins attempted the same vow of secrecy for their film The Crying Game, and asked journalists and audience members not to reveal the film's big secret. But The New York Times has let one of Salinger's big secrets slip, though many shouldn't be surprised by this revelation. Many know that Salinger died in 2010 at 91-years old, but what they might not know is that the author instructed his estate to publish at least five more books that he wrote starting as early as 2015. Some are completely new stories while others build upon characters and settings introduced decades ago. New works include "a story-filled “manual” of the Vedanta religious philosophy, with which Mr. Salinger was deeply involved; a novel set during World War II and based on his first marriage; and a novella modeled on his own war experiences." In addition, there's a collection of stories called The Family Glass, which holds five new stories about the fictional family who were part of Salinger's Franny and Zooey. And finally, there's a retooled version of a publicly known but unpublished tale called The Last and Best of the Peter Pans, which will be collected with new stories and existing work about the Caulfields from Catcher in the Rye. These kind of revelations are exciting for film fans and literary lovers. It's fantastic that a journalistic film can uncover secrets and unravel mysteries like this, and we'll be sure to keep any of the other secrets under wrap. This news of more work from Salinger was just too good too pass up, and we wonder if Hollywood will ever take a crack at bringing any of these new stories to the big screen, or if Salinger's estate has strict instructions to make sure the author's works are never adapted to a film or television series. Salinger his theaters on September 6th, and the accompanying book goes on sale September 3rd. Anyone curious? I am very curious. Salinger is my favorite author and it would be incredible to see some of his works on the silver screen (tastefully of course) Any other fans must read a short of his called "A Girl I Knew," It's incredible and you can just google it. It's not anywhere officially in print as far as I know. He didn't want it to be which makes me question this documentary but I am interested though.